The restoration of our beautiful stained glass windows has now been completed. Below are some of the updates of the work as it happened. Thank you for your generosity with the fundraising. We have now reached our target. Thank you to Marilena and to Iain for all their hard work in organising many fundraising events, which were enjoyed by the parish. The main window has been replaced in Church, the painting around the windows has been completed and the scaffolding has been taken down. 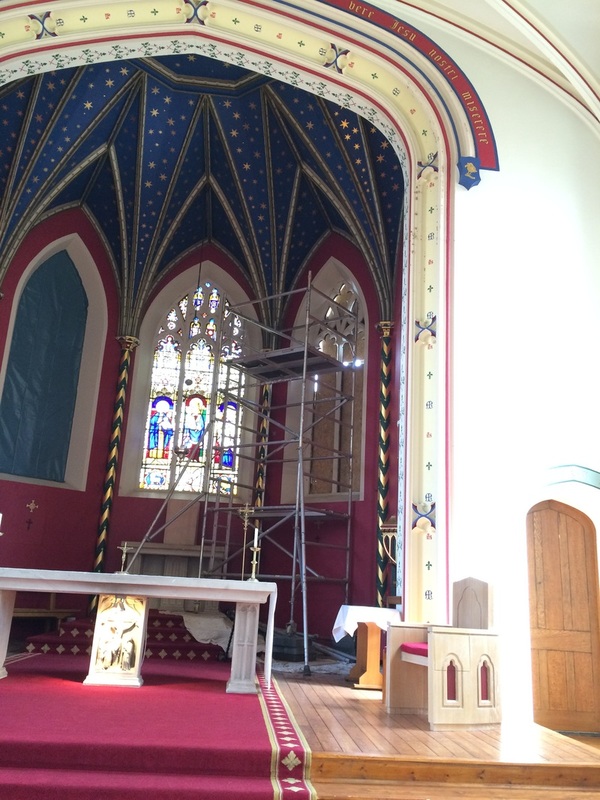 Thank you to all who have completed the work, it looks like a brilliant job has been done all round and thank you to all of our parishioners who have been patient as the work progressed and you have been so generous in our fundraising too. We can all be proud of our church. There haven't been any updates for a few weeks but work is progressing well on the outside of Church and scaffolding has gone up on the sanctuary because the main window is due to be put back into Church over the next few days. Come back later in the week to see some photos, or why not call into Church to say a prayer and have a look? The work has been progressing really well. As you can see from these pictures above the stonework has been repaired and replaced where needed and the window frames have been restored and are in the process of being painted, inside and out. Since the two windows that are back have been uncovered many people have been commenting about how good they look and noticing detail that they have not been able to notice before. These photographs below are closer images so you can see the detail in the small pieces of glass. This week the second window has returned and been re-installed in Church. It will be covered just as the other window has been, to protect the window whilst the work continues. The glass has been cleaned, and repaired where necessary and the lead has been replaced. I am sure we are all looking forward to the final window returning so we can see the transformation they have undergone. Since he left, Fr Craig has been encouraging Fr Chris to climb the scaffolding and look at the work that has taking place, but Fr Chris doesn't like heights! This is Fr Craig's last update on the windows! On Friday, he climbed the scaffolding to have a look at the progress so far, and to take some more photographs. Work is progressing well and the repair to the stonework is almost complete. Over the next two weeks, the builders will be repairing the roof over the sanctuary and the rainwater downpipes. The scaffolding has enabled us to investigate the issues with the paintwork on the main sanctuary arch caused by water ingress. Now that the carpentry repairs are complete, the decorators are busily preparing the frames for painting. The restoration of the stained-glass is progressing well and work is on schedule to be completed at the end of September. Please keep visiting this page for regular updates. It was wonderful to see the return of the first of the three windows into the sanctuary this week. The left-hand stained glass window was re-installed on Tuesday, and we were able to enjoy the beautiful colours for a few hours until it was recovered externally. 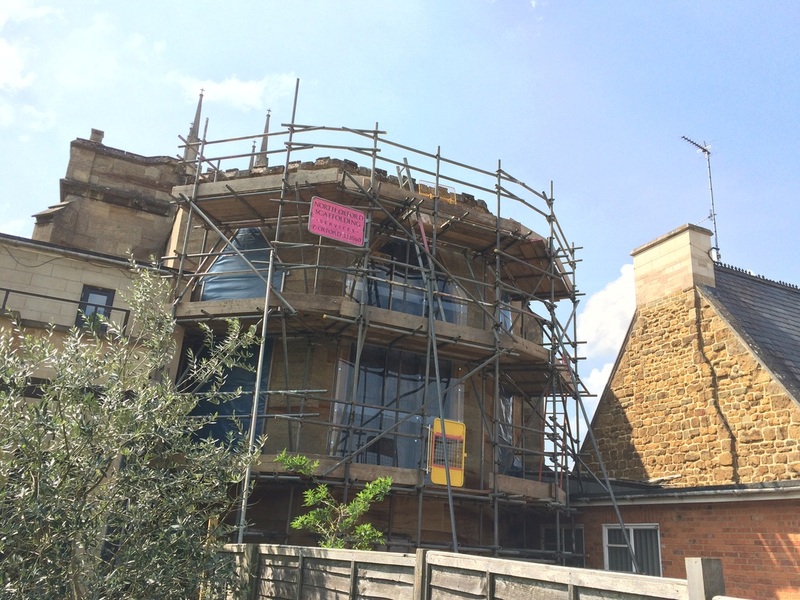 The covering is to provide protection whilst the remaining stonework repairs are carried out. The glass has been carefully cleaned and repaired where necessary. In addition, much of the lead has been replaced with new lead - even covered up, it looks very impressive! The stonework is progressing well, and almost complete. Issues with the sanctuary roof and rainwater gutters are being sorted at the same time too! We await the return of the other two windows in the coming weeks. Roll on September. It's been a busy week on site this week. The carpenter has been continuing to work on the main east window and the stonemasons have been making good progress on rebuilding much of the stonework. Work on the left-hand window is now almost complete, and we're awaiting the arrival of the restored glass this coming week. Hopefully we'll have some more photographs next week as the stained glass is installed. Watch this space! On Thursday, Fr Richard and Fr Craig ascended the scaffolding with the architect to look at the progress so far. The stonework is progressing well, as you can see from some of the photographs. The carpenter has been working very hard preparing replacement parts for each window. Work on the main east window frame involves removing rotten parts and replacing them with newly-carved parts from Douglas Fir wood. Each block of Stoke Ground Limestone is being carefully carved by the stonemason to replace the damaged stonework. 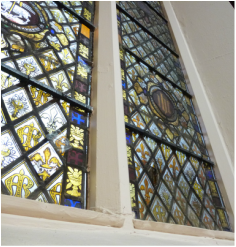 We are awaiting news of the delivery of the restored left-hand stained glass window. Well, it's certainly been a busy week for the builders! On Wednesday, the main East Window was removed for repair and replaced with clear polycarbonate - it was quite a shock to lose the beauty of this window, and only see the scaffolding! 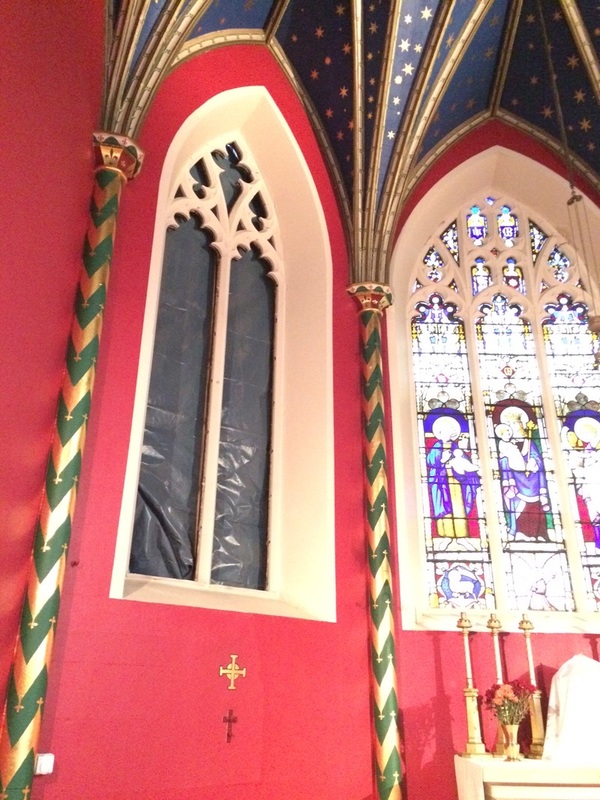 Work to repair the window frame internally has taken place by one of the carpenters and has now been covered with plastic to prevent dust and plaster from falling into the Sanctuary. As promised, I climbed the scaffolding on Friday afternoon to have a look at the progress with the external repairs. The repair to stonework is progressing well and looks very impressive! The scaffolding has also allowed us to inspect the downpipes and rainwater system around the sanctuary roof - lots of debris (and even trees!) was blocking many of the gutters so, these have been cleared and will be repaired during the works. Over the coming weeks, the repairs to the stonework and external window frames will continue in earnest. All the work is on schedule and we hope it will be completed by the end of September. I can't wait to return to Banbury and see the completed windows in all their glory! Some progress this week, despite the inclement weather! The right-hand window has been removed and has been taken away to be restored by the glazier. This has allowed the carpenters to begin repairing the rotted sections of this window. Work on the left-hand window is progressing well and should hopefully be returned in the next few weeks. Work on repairing the stonework is also well under way and we await a delivery of new stone to help with this. 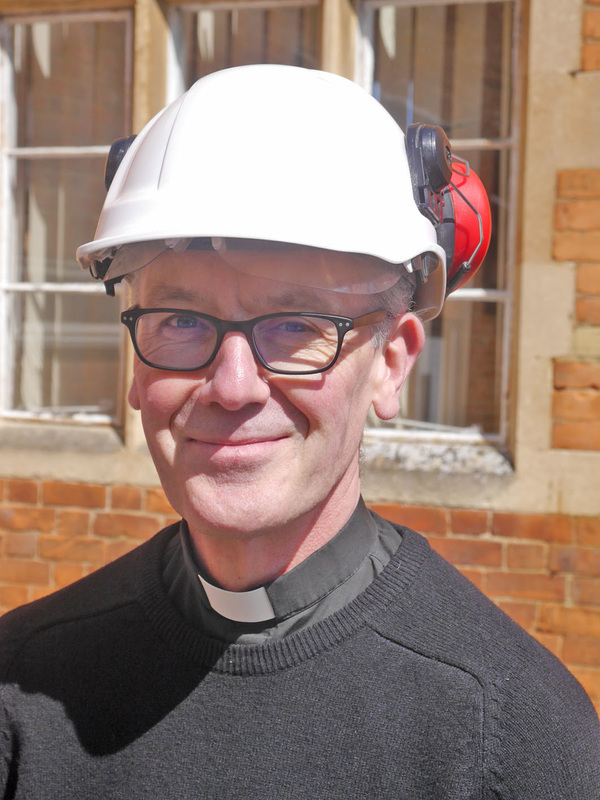 ​Sadly, we've not got many photographs this week - but Fr Craig will endeavour to climb the scaffolding next week .... weather permitting! Happy Father's Day! Not much to report this week, as it has been a quiet time on the building site. New stone has been ordered and wood for window frames is on order too - once these arrive work will resume outside. During this coming week, the glazier should be back on site, and the remaining windows will be carefully removed and transported to their workshop. Watch this space! ​As promised, I climbed the scaffolding this morning in the glorious Banbury sunshine to look at the progress on the stonework repairs. I was greeted by the stonemason with "Don't worry Fr Craig, it's not as bad as it looks!" 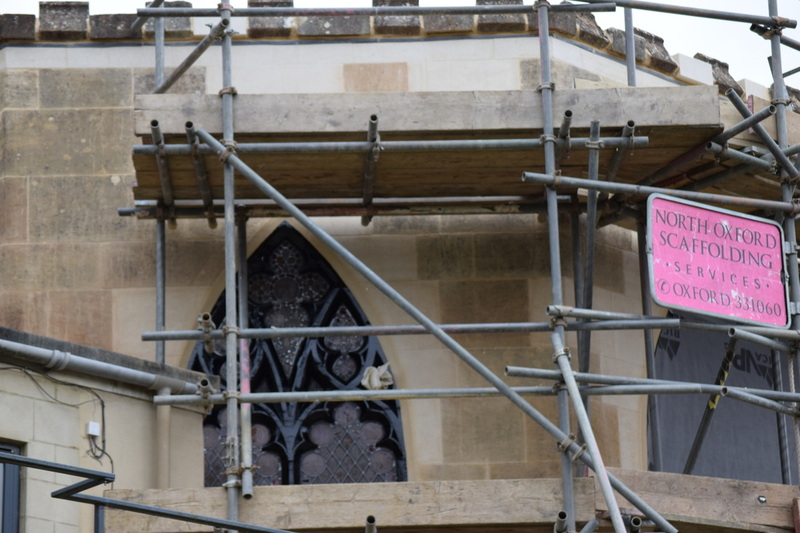 The repairs to the stone will involve the taking down of the each piece of stone from the level of the parapet to an agreed level with the Architect. This will also allow access to the wooden frames, enabling them to be assessed for damage and for the necessary repairs to be carried out. Each stone is checked to make sure that it is sound, before being numbered ready to be rebuilt at a later date. It appears that some of the stone has perished and will need to be replaced with new matching stone. The windows will be covered internally this week, to provide protection. Well, now that work has started, it looks as though someone has stolen one of the windows in the church as it has been boarded up during this past week! This has revealed the composition of the frames and the extent of some of the work that needs to be undertaken on restoring them. Lots of work has now also begun on the stone work outside. This work will involve gradually removing the stone work from the parapet to a level where it is stable, before being mended and rebuilt. I will endeavour to don a hard hat during the coming week and get some photographs of the work that has taken place. Well, work on the windows is definitely evident this week as one of the windows has now been removed. The temporary internal scaffolding has just been taken down and there now is a hole in the sanctuary wall where there used to be a window! The painstaking task of carefully removing the putty, and then the incredibly delicate glass, has been completed on the left hand window, and the others will disappear over the next couple of weeks. Once removed, the glass will be taken to the glazier's workshop for re-leading, cleaning and restoration. Even Fr Richard has climbed the scaffolding this week - along with the architect - to look at the work that needs to take place. During this past week the final preparations have been completed and the site is now ready for the first stage of work to begin next week. The scaffolding is now complete, and various security measures have been put into place to ensure both the safety of the construction team, and the protection of the building. From the inside, is still looks like nothing has happened - but don't be fooled! During the coming week, the work is expected to start in earnest. The first tasks will involve the careful removal of the stained glass and the taking down of the damaged stonework. 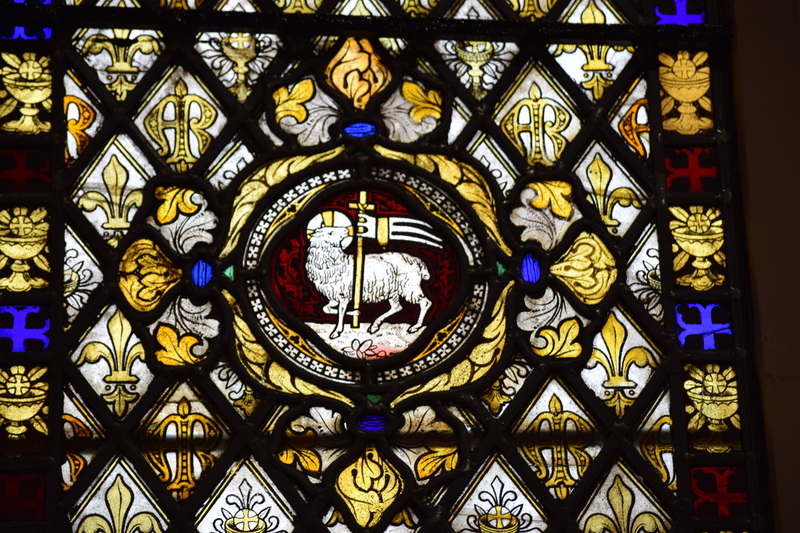 It will be exciting to hopefully gain a greater understanding of the history of our stained glass, and learn the full extent of the repair needed. Watch this space! It's my first diary entry! Whilst it may look like nothing is happening when you look inside the church, it's certainly a different picture outside! The building of the complex scaffolding tower is almost complete. This will enable the Stonemason to access the stone that needs repair, and allow the glaziers access to the stained glass and window frames. There is still some preparation and investigatory work to be carried out outside during this coming week before the windows are carefully removed for repair. The work is due to take approximately 5 months to complete - so let's hope for a good summer! ​© 2016, St John the Evangelist, Banbury.